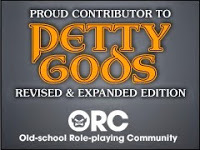 While I like to be able to scour the interwebs for some free products that GM's can use at their home table, I love to be able to point out entire new games. Talislanta has been around for over 20 years and is currently in its fifth revision. The IP holder, along with a sizable fan community, has made just about everything having to do with the game free for personal use. Aside from the downloads, all you need is paper, pencils, dice, and of course....players. The cool thing is, at least in my opinion, even if you aren't interested in playing the entire game as-is, there is such a treasure-trove of information that you can borrow for any Fantasy Role Playing Game. Looking for a few new races, maybe a game world your players haven't seen yet, or maybe you just want to spice up your monsters....all things you can easily get from Talislanta. They even have cardstock PC minis! I will admit that I have never played Talislanta, but it wasn't for lack of trying. Like many young GMs, back when I was in high school I was working on "my game". I had started with another of Bard Game's products, The Arcanum, and started adding a ton of home rules. 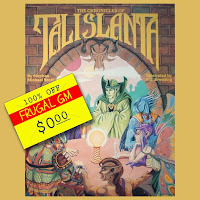 I wanted to play in Talislanta, but couldn't get any other books. Of course I didn't realize that The Arcanum was a different system altogether, but that didn't really matter at the time. Now I can dig in and check out all that material I couldn't get so long ago.